Properly known as the Court of Common Pleas Orphans’ Division, the Orphans’ Court of Philadelphia adjudicates cases involving the personal and property rights of individuals incapable of handling their own affairs, such as minors, incapacitated person, trusts, and decedents. Accordingly, the term “orphan” is defined here in legal terms as one lacking protection rather than as a child without parents. As such, the Orphans' Court has the authority to appoint guardians for both minors and incapacitated persons and adjudicate disputes over the administration of decedents’ estates, including approving accounts of administrators and/or executors and resolving appeals from the Register of Wills, such as in “will contests” like the case of Stephen Girard. The Orphans' Court Division of the Court of Common Pleas also handles inheritance and estate tax disputes and approves civil settlements involving minor plaintiffs and/or estates, as well as operates the Marriage License Bureau. The Philadelphia Orphans’ Court became involved in the campaign to desegregate Girard College after the City of Philadelphia petitioned the court in September 1954, asking it to reinterpret the will of Stephen Girard in light of changing social and political circumstances. Upon his death in 1830, banker and philanthropist Stephen Girard willed approximately six million dollars to the City of Philadelphia for the establishment of a school for “poor, white male orphans” and it fell to the Orphans’ Court to ensure that the wishes outlined in Girard’s will were honored. City Solicitor Abraham L. Freedman and Councilman Raymond Pace Alexander challenged the will on behalf of six African-American boys who were denied admission to the school, but in July 1955 the Orphans’ Court upheld the “poor, white males” provision and denied the boys’ admission. 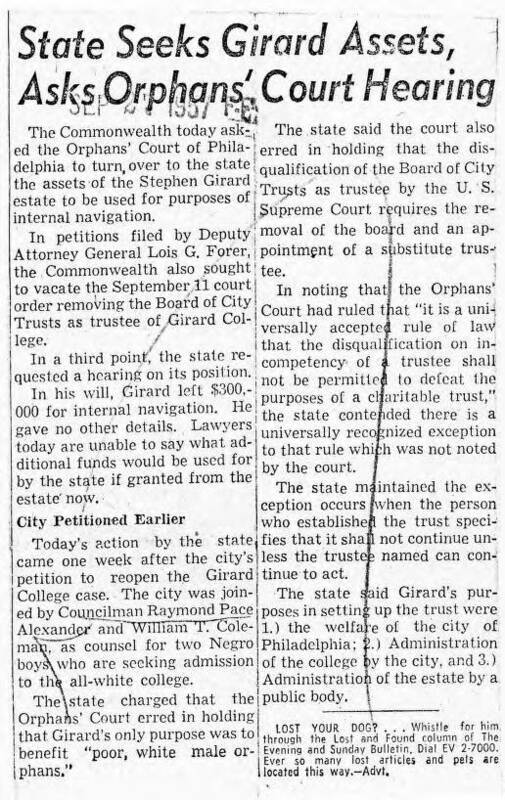 On appeal, the U.S. Supreme Court overturned the Orphans’ Court ruling in April 1957 on the basis that the Board of City Trusts, the public, city agency that managed Girard College, could not bar African Americans from the school. 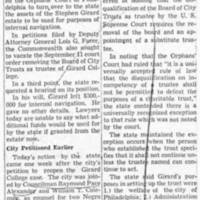 In an effort to circumvent the Supreme Court’s ruling, the Orphans’ Court removed the Board of City Trusts as administrators of the school and appointed thirteen individual, private trustees in October 1957. 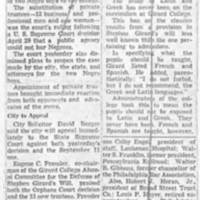 In 1958, the U.S. Supreme Court upheld the appointment of the private trustees, effectively allowing Girard College, as a private school, to determine its own admissions policy. 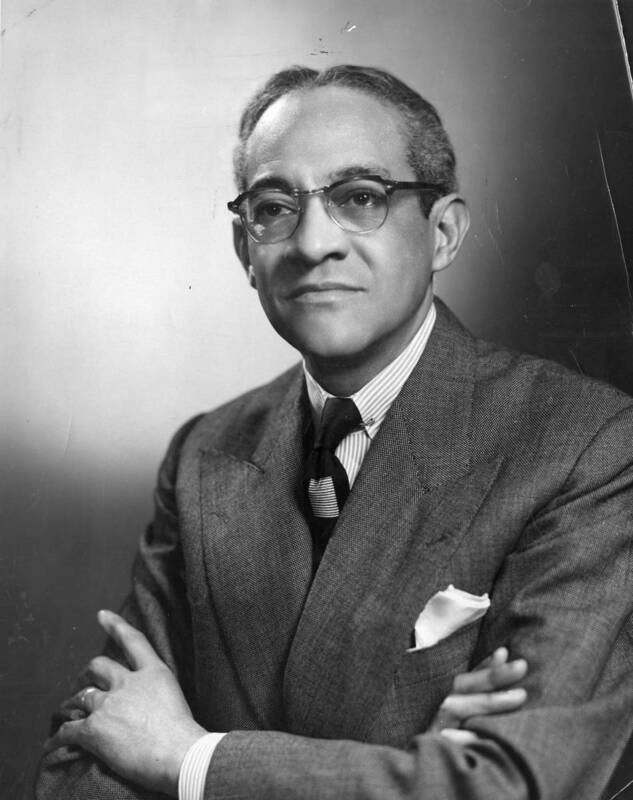 Soon after, Raymond Pace Alexander became the first black Common Pleas Court judge in Philadelphia, which meant he had to stop practicing law and could no longer pursue the case in the courts. Nonetheless, Alexander’s personal correspondence reveals that he never abandoned the effort to desegregate Girard College, even as the issue waned until the mid-sixties when Cecil B. Moore spearheaded a picketing campaign outside Girard College. Notably, the end of the involvement of the Philadelphia Orphans’ Court in the Girard College case marks the start of the evolution of the civil rights movement away from Raymond Pace Alexander’s legislative and judicial approach to justice toward Cecil B. Moore’s more radical style, which served as a precursor to the more vocal, activist-inspired civil rights movement that changed our nation. To view primary source materials about the Orphans' Court and other topics in Philadelphia's civil rights history, search our collections. “Alexander, Raymond Pace--Councilman--Girard College” folder. George D. McDowell Philadelphia Evening Bulletin newspaper clipping collection, Temple University Libraries, Urban Archives, Philadelphia, PA.
Philadelphia Courts. First Judicial District of Pennsylvania. “Court of Common Pleas Orphans’ Division.” Accessed April 25, 2011, http://courts.phila.gov/common-pleas/orphans.